When it was announced as a five movies franchise, Fantastic Beasts got a bigger scope to explore the Wizarding World’s story before Harry Potter’s journey. The first movie, Fantastic Beasts and Where to Find Them, has a fun plot but only serves to the purpose of introducing characters. Its sequel, Fantastic Beasts: the Crimes of Grindelwald has the responsibility of introducing the elements that will lead the franchise. It isn’t an easy task. In a Wizarding World increasingly distressed towards muggles, Grindelwald (Depp) comes as a spokesman for the wizards who no longer want to hide. He is after Credence (Miller), as he believes the boy’s power as an Obscurial is the key for his rising. Dumbledore (Law) sees in Newt (Redmayne) the ability to reach Credence before Grindelwald and by doing so, put his plans in a halt. Tina (Waterson) is also looking for the boy, continuing the job she started in the previous movie. Meanwhile, Queenie (Sudol), wants to marry Jacob (Fogler), and is, therefore, tired of the wizarding laws that prevent her from doing so. Judging by the number of characters mentioned in this synopsis, it is clear that the movie is full. Not only full but dense. Two hours and twenty minutes that, despite not being tiring, can definitely be felt. There are different plots for Credence, Tina, Queenie, Newt, Theseus (Turner), Leta (Kravitz), and Grindelwald. Do they meet? Yes. But it takes a while. Rhythm might be the key issue in this film. It starts with Grindelwald’s escape from MACUSA, which, despite being shown almost entirely in the trailers, is still confusing. The camera movements combined with the dark cinematography disturb the spectator’s understanding of who is where. Besides, the aurors who Grindelwald defeats are almost incompetent and do not bring the necessary level of tension to the scene. After that, the script brings introduction after introduction to allow the spectator to understand where and how each known character previously is, which takes a time that will be missed later in the movie. Because the plot has so many characters, most of them have very little screen time. Tina is more elegant and confident, ready to accomplish her mission once and for all, but Queenie seems to have become a spoiled brat, different from the charismatic and cheerful character from the previous movie. This makes conflict’s resolution unsatisfactory, as she becomes just a caricature. Jacob remains funny and charismatic, and Newt once again shows himself as a typical Hufflepuff, who is now lost in the role of a leading figure as he realizes the plot is much, much bigger than him. Even though the movie’s title does not justify itself by the crimes, Grindelwald is – at least – the strongest character in the movie. Persuasive and intelligent, it is impossible not to beg for more every time he gets out of a scene. His speech is powerful and has logic, which makes him more dangerous than Harry Potter‘s villain, Lord Voldemort. Grindelwald does not get his hands dirty, he does not compromise. He manipulates others to follow his commands without realizing it. 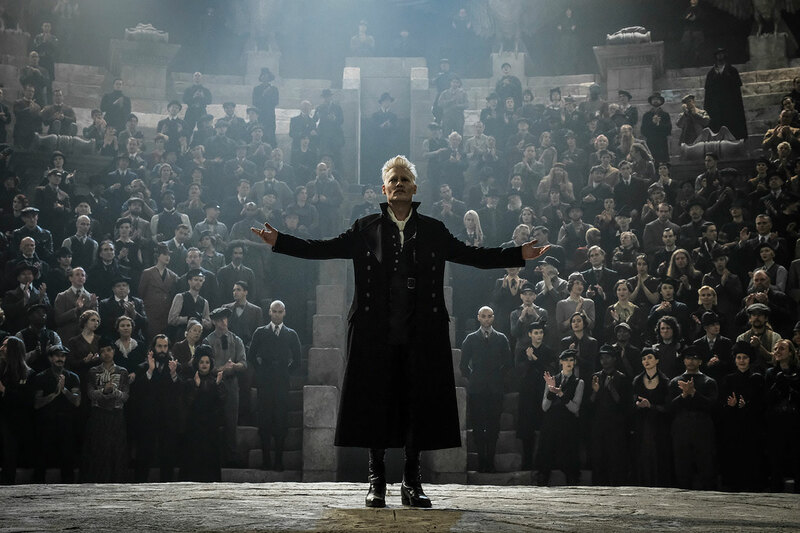 In a scene where he gives a chilling speech, Grindelwald uses a muggle historical moment to make his point. It is terrific. When it comes to the script, despite great dialogues, J.K. Rowling still hasn’t learned to control herself and seems to be writing a book instead. Many elements in the movie have no use, like a character who simply vanishes in the middle of the story. There is an important plot that, instead of being developed along the movie, is thrown in a grotesquely exposed scene – which makes the story lose almost completely its impact. The script has some amateur flaws, but its consequence is felt due to a bigger factor: David Yates. A director is the heart of almost any film. He is the general supervisor through whom all decisions have to go through. When receiving a heavy and sometimes confusing script, the director needs to be able to keep what is good, cut what is bad and adjust what can be improved. Aside from not doing this, Yates adds too many action scenes, not allowing the spectator to understand what is happening. In a reflexive, motionless scene, he uses a camera in the hand that only blurs the screen; in the first scene between Newt, Leta and Theseus, he focuses so much in the actor’s faces that besides being uncomfortable, it has no narrative reason. What luckies out is the production design. Stuart Craig remains brilliant in his tenth Wizarding World movie. The fantastic beasts were well made and it is impossible not to feel delighted by a Zouwu roaring. Newt’s place is a habitat for many creatures, and it is a lovely, roomie and vivacious environment. Paris in 1920 is charming and its little houses are cozy. Leta and Tina’s costumes are opposed in blue and dark wine colour, apparently made from the same fabric. The drastic change of colors in Queenie’s costume – although it maintains some colorful elements – is a big hit from costume designer, Colleen Atwood. Finally, Fantastic Beasts: the Crimes of Grindelwald is a good film, but has very apparent flaws. 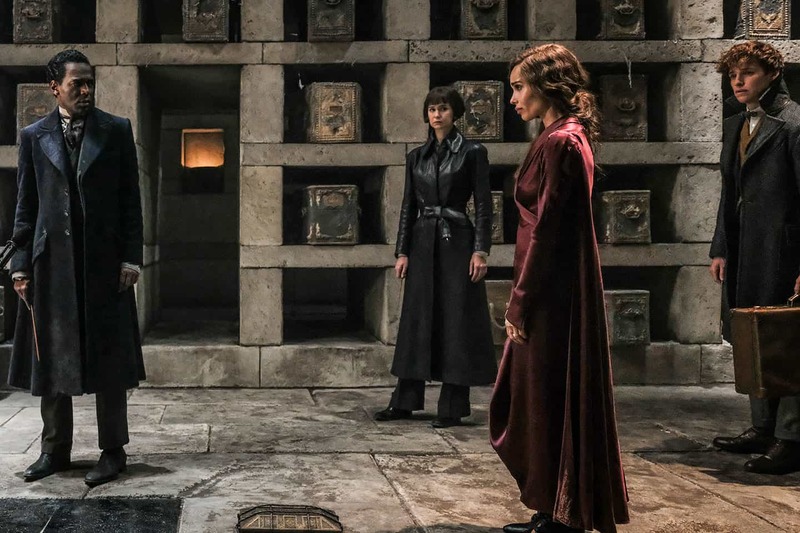 It is necessary a self-evaluation from the producers, to allow the story to be forwarded in a proper way until its end, in 1945, year in which Dumbledore and Grindelwald will duel. In Crimes of Grindelwald there is a bigger step than in Where to Find Them, but there is a lot of time until the franchise establishes itself in a proper way. PS: The final credits are beautiful, it is worth it to watch them! Marina Anderi is a film-maker and Potterish’s marketing manager. Written by J.K. Rowling and directed by David Yates, Fantastic Beasts: the Crimes of Grindelwald opens worldwide on November 16th.